The Minutemen played a crucial role not only in the Revolutionary War, but in earlier conflicts. 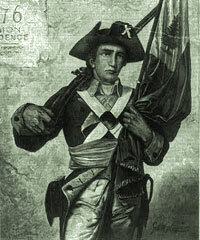 Minuteman holding musket and flag. Cover illustration from Harper's Weekly, July 15, 1876. Wood engraving by Speer, "from a picture by George W. Maynard, in Memorial Hall, Phila." Although today Minutemen are thought of as connected to the Revolutionary War in America, their existence was conceived in Massachusetts during the mid-seventeenth century. As early as 1645, men were selected from the militia ranks to be dressed with matchlocks or pikes and accoutrements within half an hour of being warned. In 1689 another type of Minuteman company came into existence. Called Snowshoemen, each was to "provide himself with a good pair of snowshoes, one pair of moggisons, and one hatchet" and to be ready to march on a moment's warning. Minutemen also played a role in the French and Indian War in the 1750's. A journal entry from Samuel Thompson, a Massachusetts militia officer, states, "...but when our men were gone, they sent eleven more at one minute's warning, with 3 days provision..." By the time of the Revolution, Minutemen had been a well-trained force for six generations in the Massachusetts Bay Colony. Every town had maintained its 'training band'. The adversity that this region faced — Native-American uprisings, war with France, and potential for local insurrections, social unrest, and rioting — provided ample reason to adhere to a sound militia organization. In his recent book, perhaps David Hackett Fischer puts it best, "The muster of the Minutemen in 1775 was the product of many years of institutional development...it was also the result of careful planning and collective effort." (p. 151). By the time of the Revolution, Massachusetts had been training, drilling, and improving their militia for well over a hundred years. Unfortunately, one thing the Minutemen lacked was central leadership. This disadvantage would lead to their dissolution. In February of 1775 Concord was one of the first towns to comply with the order to create Minutemen companies out of the militia. Of approximately 400 militia from Concord's muster rolls, one hundred would also serve as Minutemen. When a battle took place Minutemen companies from several towns combined their units. An officer from the 43rd Regiment of Foot was sent to the North Bridge in Concord with a number of light infantry. Minutemen from Concord, Acton, Littleton, and other towns combined forces. After a few volleys were fired, the British light infantry retreated back to the Concord Common area. Lacking central command, with each company of Minutemen loyal to their own town, they did not pursue the redcoats. In the running battle that ensued fifteen miles back to Boston the Massachusetts militia would see their last action as Minutemen in history. The militia would go on to form an army, surrounding Boston and inflicting heavy casualties on the British army at Bunker and Breed's Hill. Thus, although lacking central command, the Minutemen were still better organized and battle-tested than any other part-time military. They were a vital and necessary force, playing a crucial role in not only the Revolutionary War, but in earlier conflicts. Without these "ready in a minute" men, our history may have been written in a very different way.